Wind of Luck: Arena" sets you in the role of the captain of a one basic vessel of three very different shipbuilding traditions - Caribbean, Mediterranean and East Asian. The game is centered on the naval battle - dynamic, decisive and devastating constant action where skillful captains can sink much bigger ships, using a wide variety of different tricks and unusual actions. The game features team Vs team battles, which allows you many combinations. You can fight against random opponents or train together with your friends, sharpening various combat skills and exploring various locations. 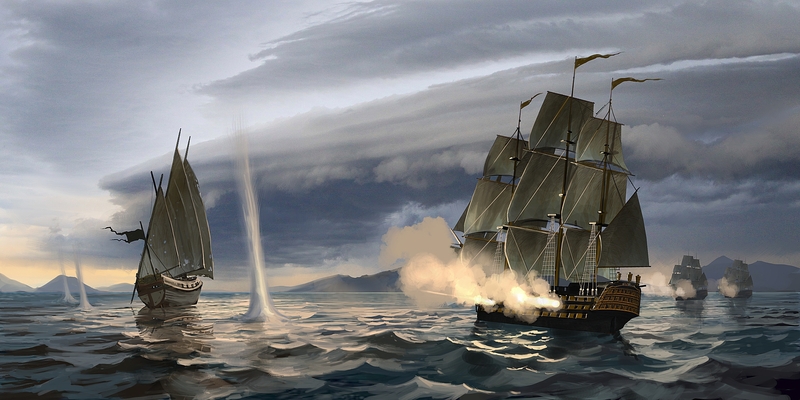 Battles will take place in truly special seascapes which offer not only a good spectacle, but also the tactical challenge of a variety of battle conditions. Reflection of the ship in the sea, traces of its movement and the wind that fills the sails will make you feel like you're really in the middle of the naval battle. Numerous enhancements have been made in graphic settings and fonts. Many GUI elements were redone to achieve the best readability possible. The ribbon and an ensign for tracking wind direction were added. Two new locations "Imperial Pearls" Asia and "Lost Expedition" Arctic have been added. Based on battle results the player will receive piastres, fame points and skill points. You may now explore and buy new ships. Various experts and skilled crewmen may now be employed. Players can receive Status symbol images for various achievements. The ability to improve individual parameters of the ship has been added. The ship may now be equipped with special armaments. You may also equip the ship with equipment that will improve its characteristics. You now have the ability to repair your ship. Different types of guns can be established on the ship. You can now choose what types of charges would be loaded on the ship. You may now set the flag for your ship. The sails on the ship can now be changed. An achieved Status symbol may be displayed on the sails of your ship. Developers of the "Wind of Luck: Arena" game are happy to announce the new patch, that will improve overall gameplay and gaming experience.